WASHINGTON--(BUSINESS WIRE)--ZimGo Polling, BPU International’s new SaaS election analytics product, is now available just in time for the 2018 U.S. campaign season. This is the first election analytics AI cloud-computing tool utilizing the hyper-accurate, patent-pending Artificial Emotional Intelligence (AEI) ZimGo engine. ZimGo Polling promises to reduce the growing “margin of error” rampant among legacy polling services, along with lowering human bias common to past survey methods. ZimGo Polling delivers accurate, actionable citizen sentiment as the cornerstone of successful campaigning. In the most recent South Korean presidential election, the Korean version proved more accurate than six other polling services, including Gallup and CBS Realmeter. The U.S. version is now tracking elections using demographics and geography in national U.S. campaigns. 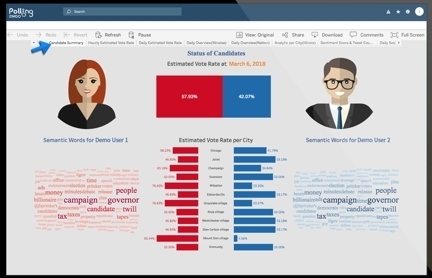 "Automated emotion understanding -- emotion AI -- is now a must-have capability for consumer marketing and public-facing campaigns, including electoral campaigns. Attention, shares and decisions are driven as much by emotion as by fact,” states Seth Grimes, principal analyst for Alta Plana specializing in natural language processing (NLP), text analytics and sentiment analysis. “Today's competitive campaigns apply technology to understand both fact and feeling and shape opinion." BPU’s near decade of AEI research bypasses larger companies with limited Sentiment Analysis. Some have announced simple APIs, while BPU’s ZimGo platform supports both APIs and complete Sentiment Analysis applications such as ZimGo Polling and ZimGo Search (www.zimgo.com). While other platforms perform Syntax Analysis one sentence at a time, BPU’s AEI scores entire paragraphs, including emoticons. Others use a standard dictionary, while BPU interprets slang using configurable dictionaries. AEI provides Entity Recognition analysis, for people or organizations, over time by person, brand or entity. For more information on ZimGo Polling and a full list of features, visit the website. Sales inquiries to our Las Vegas, Nevada, office may be made to (702) 824-9717 or toll-free: (866) 851-6832. BPU Holdings is a South Korean corporation that makes social networks better and search tech smarter, empowering the individual as the center of the connected universe. They bring this advanced technology first to the South Korean market, then to the world through BPU International. The company currently focuses on Big Data, Natural Language Pattern recognition, Machine Learning algorithms, Social Science and Tribe Management as a service. Information about BPU is available by contacting press@bpuholdings.com.